A powerful explosion in an active Hawaiian lava crater was captured on webcam by the US Geological Survey. The footage shows how a rock fall prompted the lava lake to burst. The video shows Hawaii’s active Halemaʻumaʻu Crater in the Kilauea Volcano, often view at close range by tourists, as the crater’s rocky wall suddenly collapses into the lava lake, causing an avalanche of dust to form. The breathtaking imagery shows rocks crashing into the lava followed by a massive red explosion with a wave of fire and plume of smoke roaring into the air. Large spatters of molten lava go flying everywhere. “Fist-size clasts were deposited around the closed Halemaʻumaʻu visitor overlook,” the USGS’ Hawaiian Volcano Observatory said, commenting on the Sunday explosion. No injuries were reported after the incident at the crater, which has been shut to visitors due to its recently increased activity. The stunning blast was captured by the observatory’s webcams stationed around the summit. 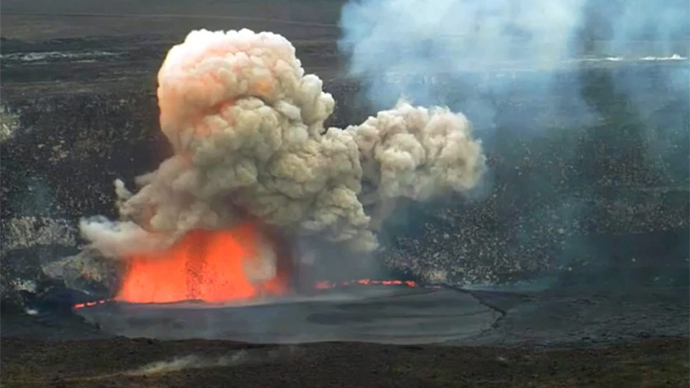 The Halemaʻumaʻu Crater has been active since March 2008. The lava lake was overflowing during the weekend and still poses a potential hazard, according to geologists.